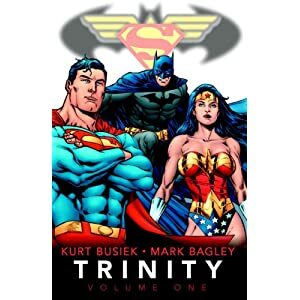 In the world of DC Comics, Batman, Superman and Wonder Woman are the big three. And this story takes firm advantage of that fact. Something is sending dreams to the big three. Disturbing dreams. As they come together to try and find out what the deeper meaning is, they call on friends to help them out. Meanwhile, Morgan Le Fey and the mysterious Enigma bring in Desparo to try to get to whatever the secret is first. And since things can never be simple in the lives of Superheroes, a woman with the power to know the future through tarot (called, appropriately, Tarot) has become incredibly important to it all. Former Hero, Gangbuster, comes out of retirement to help rescue her when she's been taken by Morgan LeFey and company. The whole cast of characters is brilliantly written and wonderfully drawn. The story is engaging and had me up until all hours, knowing that I needed to sleep but just wanting to read one more page. I suspect Vol 2 (which I picked up from the library today) will be very much the same.